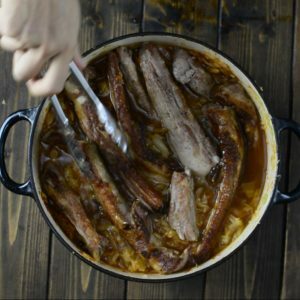 This mouthwatering Cabbage with Ribs recipe is a life-changer! 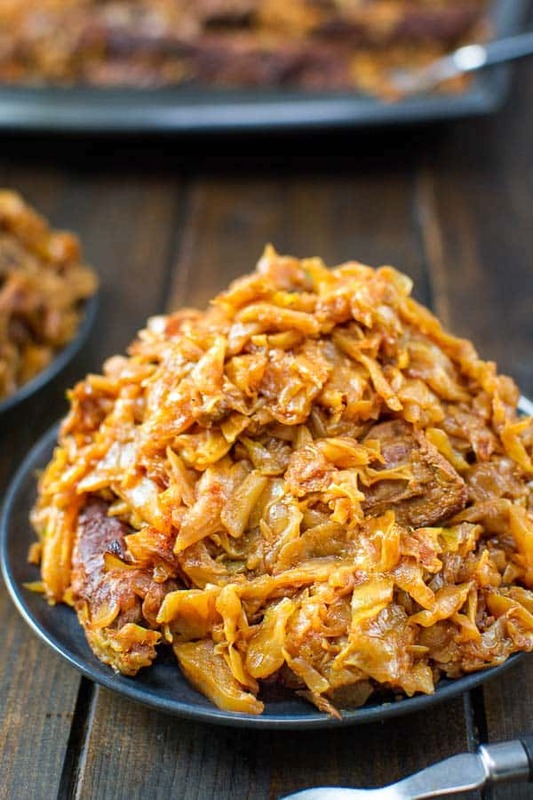 Delicious cabbage stewed, and then baked to perfection with tender and succulent ribs. 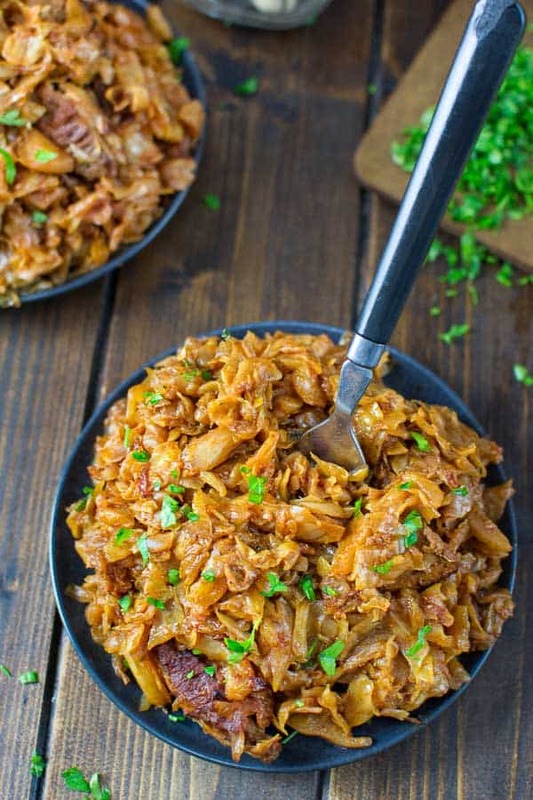 Sautéed cabbage is one of the most loved recipes in my family. I usually cook it with chicken, but recently, my mother-in-law came to visit us from Bulgaria. 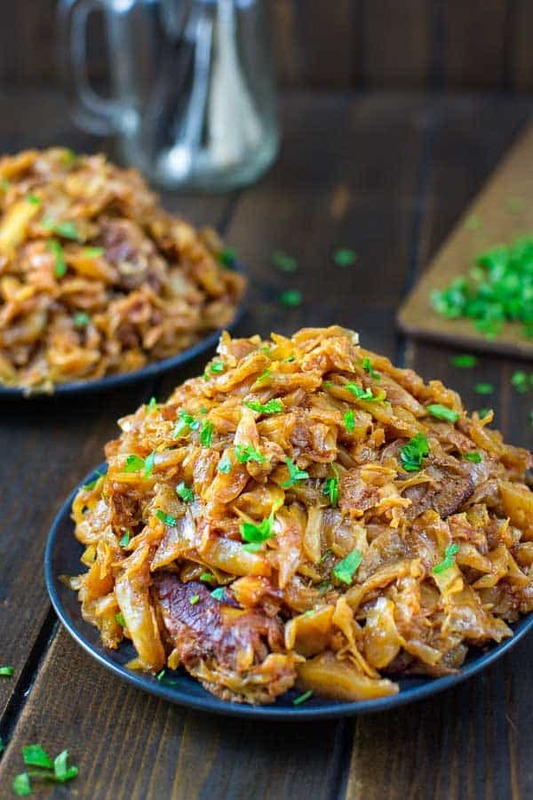 When she cooked this Cabbage with Ribs, we all fell in love with it instantly. This is hands down, the tastiest dish I have eaten this year! It takes a little time to cook this yumminess, but the wait is really worth it. 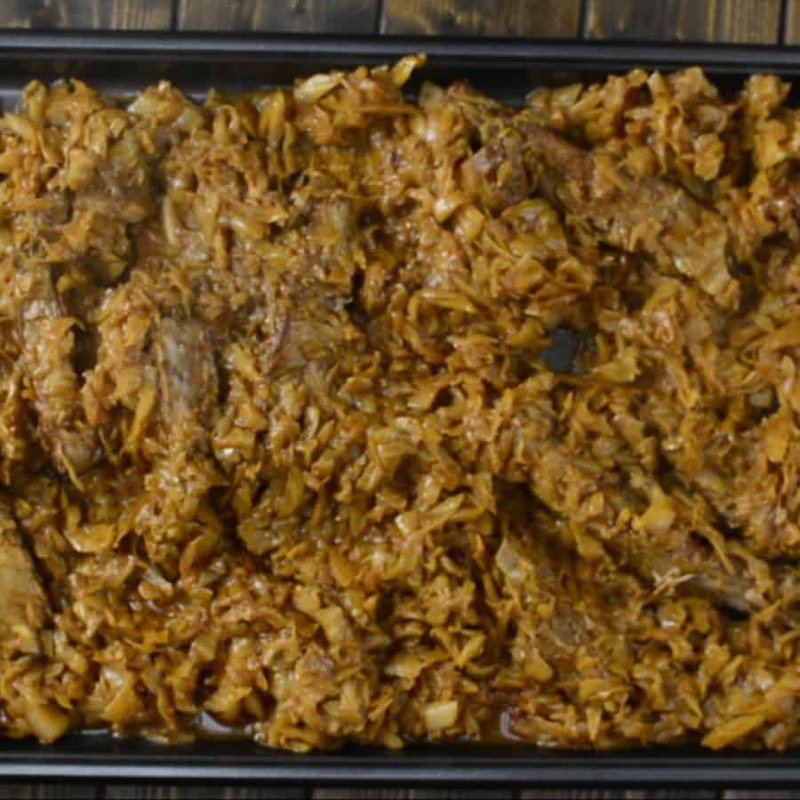 First, the cabbage will be stewed with ribs on the stove, and then baked for an additional 20 minutes in the oven. The meat will be very soft and falling off the bone, and the cabbage will be full of flavor. So, without further ado, I present to you CABBAGE WITH RIBS. Let’s start cooking! 1. 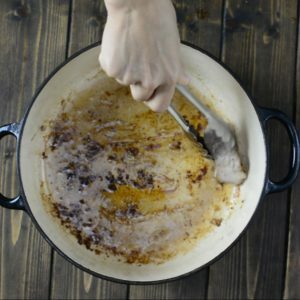 In a large pot, heat up the vegetable oil and sear the ribs on both sides. Season the ribs generously with salt and pepper and then remove them from the pot. 2. To the same pot, add the cabbage, and cook for about 15-20 minutes, until it shrinks down. You may have to add it gradually, allowing it to shrink more and more, if your pot is not big enough. 3. Add the tomato paste and paprika, and stir well. Place the ribs on top and add about 3 cups of water. (The water should completely cover the cabbage). 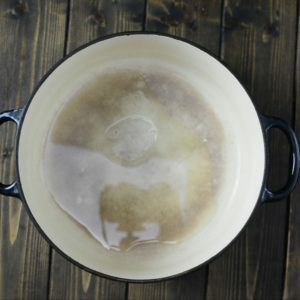 Cover with a tight lid and cook for 1 1/2 hours on low heat, stirring occasionally, until the meat becomes tender. Taste if the dish has enough salt and adjust, if needed. 4. Transfer the cabbage into a large baking dish or tray. You should have a little liquid remaining at this point. Bake at 450⁰F for about 15-20 minutes, until the liquid completely evaporates. In a large pot, heat up the vegetable oil and sear the ribs on both sides. Season the ribs generously with salt and pepper and then remove them from the pot. 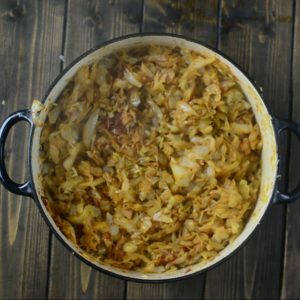 To the same pot, add the cabbage, and cook for about 15-20 minutes, until it shrinks down. You may have to add it gradually, allowing it to shrink more and more, if your pot is not big enough. Add the tomato paste and paprika, and stir well. Place the ribs on top and add about 3 cups of water. (The water should completely cover the cabbage). Cover with a tight lid and cook for 1 1/2 hours on low heat, stirring occasionally, until the meat becomes tender. Taste if the dish has enough salt and adjust, if needed. 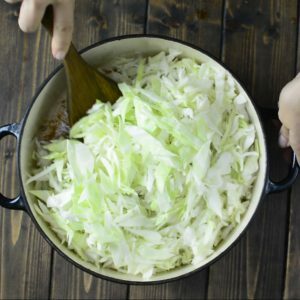 Transfer the cabbage into a large baking dish or tray. You should have a little liquid remaining at this point. Bake at 450⁰F for about 15-20 minutes, until the liquid completely evaporates. I only have smoked paprika at home, would this work or throw off the flavor too much? Hi Traci! Smoked paprika will work too. Happy cooking! Thank you so much for sharing, Donna! I am glad you enjoyed it! Just wanted to ask if boneless Ribs would work. Hi Mary! Yes. Boneless ribs would work too. Thanks and happy cooking! Wow! Comments like yours, keep me going, Laura! Thank you so much for your feedback! Made this today, great taste. Added a bit of garlic powder. Anyway to do this so the cabbage comes out firmer? Hi Will! In the Step 3, cook the ribs without the cabbage and add the cabbage during the last 15 minutes. Hope this helps! Thank you so much! I made this tonight. There are only two of us so I cleverly decided to only use half a cabbage, half the tomato paste and paprika. Do not do this. We have lots of ribs left so I am now cooking the other half of the cabbage. It is delicious. Hi Diane! Indeed, cabbage wilts down a lot while cooking. Thanks for sharing the feedback and I am glad you enjoyed the dish! Hi Delores! 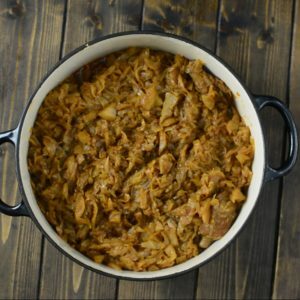 You should cook the cabbage on low heat. Thank you for the comment, I updated the recipe accordingly. Happy cooking! 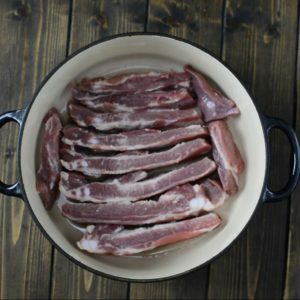 Hi – making this for dinner tonight and I have a quick question. 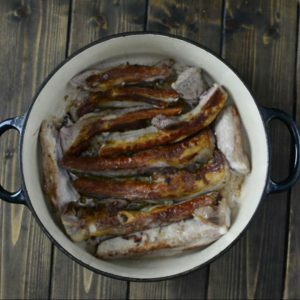 When you transfer the cabbage to a baking pan to go in the oven, do you also transfer the ribs? 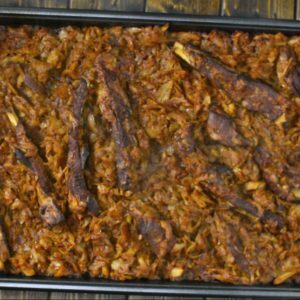 The recipe only mentions cabbage but your picture of the cooked baking pan includes ribs – but maybe you added those afterwards. Thanks! Hi! 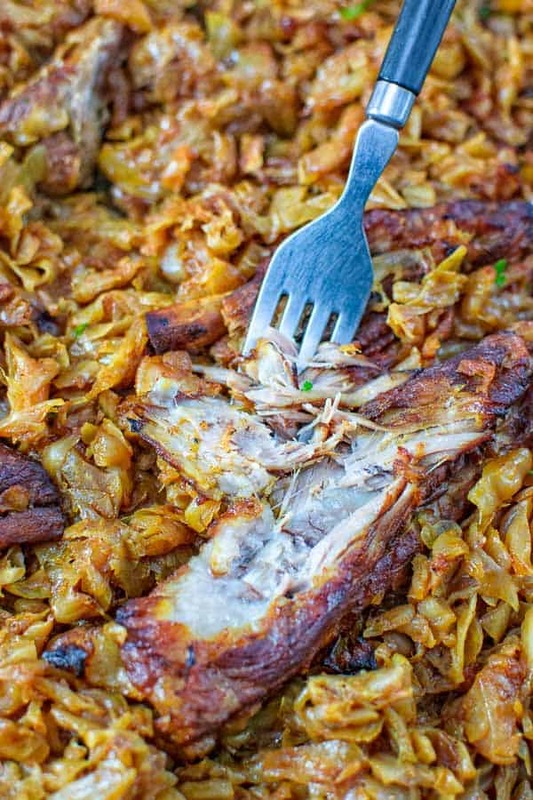 Yes, you would transfer everything (cabbage and ribs) into the baking pan. Let me know how you enjoyed the dish! What kind of pork ribs did you use? Did they have bones? Looks delicious. Hi Diane! These are regular bone-in pork ribs. Once the meal is ready, the meat will be falling off the bone. So tasty!